Boilsoft DVD Creator is an eay-to-use DVD creator and a DVD burner. This DVD creator can convert your favorite movie files into a DVD. Input formats support AVI, MPEG, DivX, DV, VOB, FLV, WMV, 3GP, MP4 and Mov, etc. Boilsoft DVD Creator is a powerful DVD creating program and a DVD burner which can be used to burn your favorite video files such as AVI, MPEG, DivX, MTS, RMVB, DV, VOB, WMV or iPhone 4/iPhone 4S videos (MOV) into a DVD discs for playback with DVD player. 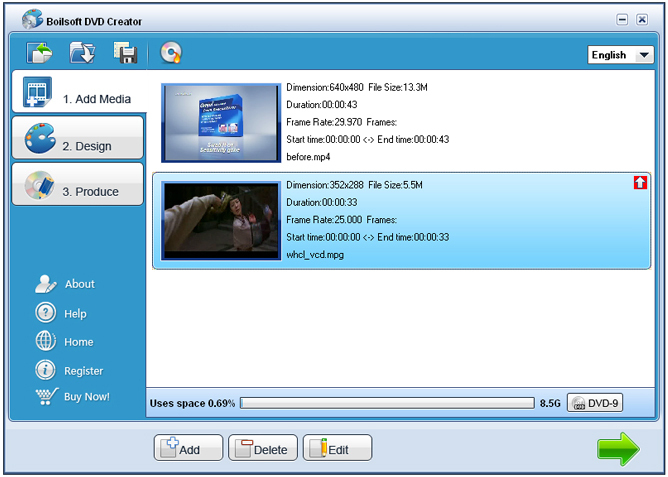 With Boilsoft DVD Creator, you can also burn all sorts of videos into a DVD folder for backup or for later burning. AnyMP4 iPod Video Converter is a professional iPod Video Converter, which can convert popular video files such as MPEG, MP4, MOV, AVI, etc. and even HD video, like HD TS, HD MTS, HD H.264, HD RM, etc. to iPod. Xilisoft iPhone Software Suite for Mac is an all-round iPhone pack to convert DVDs/videos to iPhone MP4 videos or MP3/M4A/WAV music, make iPhone M4R ringtone from video/music, and transfer files between Mac and iPhone, from iPhone to iTunes on Mac.